Your Compressed Air Supply Is Our Priority. GTEC have over 45 years experience providing compressed air solutions to industry. We offer compressed air solutions tailored to your application. Setting up a new workshop? Upgrading your compressor? Our TOTALAIR+ solution could be right for you. Contact one of our technical advisers for your free consultation today. Already own your equipment? Our skilled fleet of mobile engineers are on hand to maintain and repair your equipment. Contact our servicing team today to discuss your maintenance or call out requirement. Looking for service spares, compressor parts, compressed air pipework, air treatment products, hose reels, couplings or consumables? We pride ourselves on the quality of our products with next day availability on many lines. Contact our sales team today to discuss your requirement. Call us on 020 8519 1526 for free, zero-obligation technical advice	on your exact requirements. 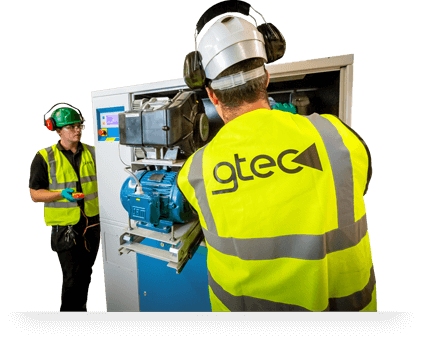 After struggling to find an honest, reliable, and responsive Compressor maintenance company ITV employed the services of GTEC and have not looked back. Can honestly say it's been a pleasure working with you and I look forward to welcoming you back into the fold once our new building is complete. For over 45 years GTEC has been owned and run by compressor engineers. Compressed Air Technology is at our core and providing well engineered, economical solutions for our customers is our goal. Contact us today for free, no obligation advice from one of our trained technicians. We can help with your enquiry. Contact a member of our team to discuss your requirement in further detail.